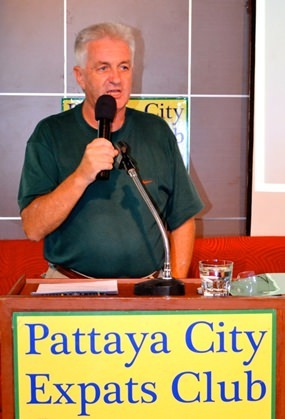 Pattaya City Expat Club members and guests were given some interesting facts about Bangladesh and Vietnam. Club member Nathan Russo shared two recent experiences at their April 6 meeting; one being his efforts to find and reward a man in Bangladesh for his heroic efforts to help his fellow man and the other about his visit to a Vietnamese family in the Mekong Delta to celebrate Tet (Chinese New Year). Nathan divides his time between Thailand and USA. He spends a lot of his time here doing charitable projects such as building schools, orphanages and helping poor people in general. Nathan said he learned about a factory worker in Dhaka, Bangladesh who risked his life numerous times last year pulling people out of the wreckage of the Rana Plaza garment factory. Further, during three of the rescues he had to actually amputate a hand, an arm, and a foot inside the wreckage because doctors were too frightened to enter the collapsed building. Stories appeared on-line in the English, Daily Mail, BBC and Newagedbd.com. Nathan Russo shares two interesting experiences: travelling to Bangladesh to find and reward an unsung hero, and visiting Vietnam to share ‘Tet’ or Chinese New Year with his friend Loan and family, in a small village in the Mekong Delta. Other than the publicity, apparently Didar Hossain received no recognition or reward for his gallant efforts. Nathan said he decided the best way to acknowledge this man’s accomplishment was to reward him financially and set out to raise US$1,000. Nathan mentioned that the first hurdle was to even find one individual in a city with a population of 15 million people. He described the efforts which involved more than 40 emails and 2 month’s effort. Finally through an administrator at the American International School in Dhaka, he contacted David Bergman, a British human rights activist and investigative journalist and editor based in Bangladesh who was able to find Didar. Nathan then shared his photographs and story about going to Dhaka, meeting Didar and giving him his reward. He then described his subsequent visit to the factory site and meeting with Didar’s family at their home. Further, he described how the collapse was apparently caused by heavy electrical generators being placed on the fifth floor of the building originally not built to be a garment factory; the generators’ weight and vibration is thought to be the primary cause of the collapse. To learn more about Didar’s heroic efforts, visit the following URLs: http://www.newagebd.com/detail.php?date=2013-04-28&nid=47520#.Uz0sL6JaeSq and http://www.dailymail. co.uk/news/article-2319439/Bangladesh-building-collapse-Rescuer-forced-amputate-trapped-peoples-limbs -save-wreckage.html. Nathan then paused to answer many questions from the audience before proceeding into his trip to Vietnam for Tet. Tony Heron conducts the Open Forum, where questions are asked and answered about Expat living in the ‘Land of Smiles’. He stated that usually he wouldn’t go to Vietnam during the Tet holiday (Chinese New Year) because the entire country closes down for about 10 days; thus many of the venues you might want to see in Vietnam are shut down. Also travel can be a real hassle since trains, buses and planes are booked weeks and months in advance. However, he said he was lucky enough to have developed a few friends over the years visiting Vietnam and these friends invited him to join them for the holiday, which provided a very real insight into the Vietnamese culture. On this particular holiday he said he spent his time in the Mekong Delta with his friend, Loan’s family. Nathan explained that the Tet holiday is the biggest holiday of the year in Vietnam. It is the western New Year, Christmas, Easter and Thanksgiving all rolled into one festive time. It is the time of no work, giving gifts, visiting homes of relatives, honoring the oldest members of your family and your ancestors. He described his adventure of taking a motorbike trip south to a small village called Vinh Xuan not far from Can Tho, the largest city in the Mekong delta and how they used the bus system to send many items needed for the festivities that they couldn’t carry. Nathan explained that flowers play a very big role in the Tet celebration. Even if the poorest people cannot afford flowers most of the year, everyone from richest to poorest buys tons of flowers to decorate their homes during the Tet holiday. Nathan then shared his photos and described the festivities involving a lot of time spent honoring ancestors, including setting out food at various tables around the house for the ancestors. After a reasonable time, it was gathered up and set out for the family to enjoy. Nathan said that his trip to the Delta was such a success that Loan’s family has invited him back next year. He then described his trip back to Saigon by bus and then going by car with his friend Viet and family to Mui Ne; his favorite beach resort in all of Vietnam. He concluded by stating that enjoying Tet with Vietnamese friends will always be one of his favorite memories of living in Southeast Asia. Following Nathan’s presentation, Master of Ceremonies Judith Edmonds brought everyone up to date on upcoming events and called on Tony Heron to conduct the Open Forum where questions are asked and answered about Expat living in Thailand. 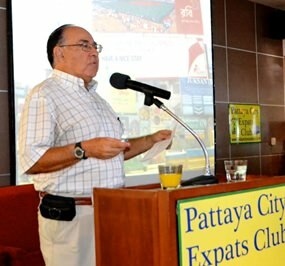 For more information on the Pattaya City Expats Club’s many activities, visit their informative website at www.pcecclub.org. 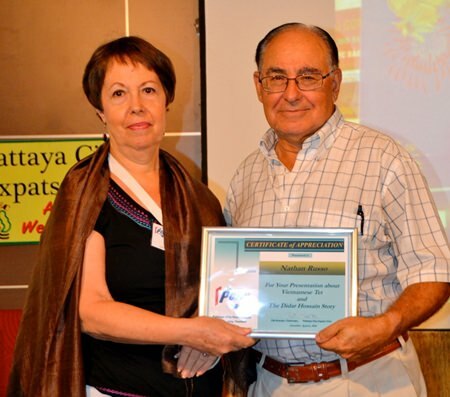 Following Nathan’s talk, MC Judith presented him with a Certificate of Appreciation.